We all love our way of life and island paradise, but we know Mother Nature can be fickle and send serious storms our way, such as Hurricane Irma. There’s also a long-term impact to our region which we are now more aware of. I’m talking about climate change. 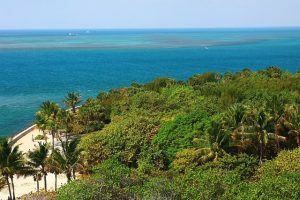 We’ve been seeing the evidence of climate change for several years now; here in the Florida Keys, our ecosystem is fragile enough that we need to act now to protect it. In comes GreenKeys! Sustainability Action Plan, the 5-year plan Monroe County has established to weather the storm of climate change. The most significant climate impact we are facing across the Florida Keys is the rise in sea levels. Being islands after all, as the sea rises, our islands lose ground. As a community, we want to protect the ecosystem and the people who live here from the devastation of higher sea levels. To this end, Monroe County put GreenKeys! in action starting June 2016. The overall goal is to create sustainable community programs and procedures which focus on our built-in infrastructure, climate impact & energy use, education programs, health & safety programs, our island ecosystem, and government operations. Several elements are already underway. One example is ongoing community workshops to learn sustainable practices, such as the benefits eco-friendly homes. Currently, there are ongoing studies to determine erosion rates and road inundation risks, with the goal of safeguarding and improving impacted areas in sustainable ways. Canal restoration projects have also begun and are set to continue. Community supported agriculture programs are also being expanded to support more farm-to-table economic benefits alongside sustainable agricultural practices. The GreenKeys! Sustainable Action Plan is key to helping protect our incredible island way of life. I encourage you to take a look at what’s been going on; as a community working together, we can make a difference. When you are ready to experience life in the Florida Keys year-round, or want to buy or sell a home in the Key West area, please contact me, Jimmy Lane, for all of your real estate needs.